Michael Andretti and Kurt Busch teamed up at Indianapolis Motor Speedway this week as Busch embarked down the road to doing 'The Double'. (Photo courtesy of Furniture Row Racing. 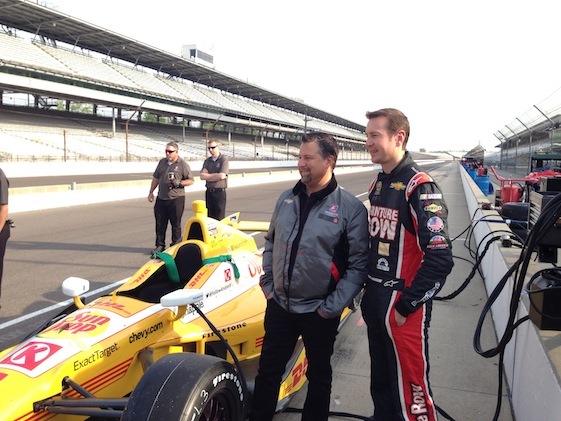 Kurt Busch completed the Indianapolis 500 Rookie Orientation Program during a test Thursday at Indianapolis Motor Speedway, where the 2004 NASCAR Sprint Cup Series champion reached a top speed of 218.210 mph in a car without fenders. What was also special for Busch was having his Furniture Row Racing Sprint Cup crew, along with team owner Barny Visser and general manager Joe Garone, make the trip to Indianapolis to watch him perform. The team was on its way to Darlington, S.C. from Denver, Colo. for Saturday night’s Southern 500. “When our Furniture Row guys showed up it made a great day even better,” said Busch. But Busch is taking a cautious approach toward participating in “The Double” of racing – the IZOD IndyCar Series’ 97th Indianapolis 500 and NASCAR’s Coca-Cola 600 at Charlotte Motor Speedway on Sunday, May 26. “I need to get more comfortable in the Indy car because on a day like today, I’m white-knuckle, my hands were tense and firm, and that was only after 10 laps,” Busch said after exiting a car provided by Andretti Autosport. “And so then it started to settle in. “So there’s the mental side of it, there’s the physical side, there’s the sponsorship side that has to come together. And right now with Kyle Moyer (general manager, Andretti Autosport) looking sideways at Michael (Andretti)…Michael wants to do it, but they’ve already got five cars committed to trying to qualify for the Indianapolis 500 this year. Busch completed the mandatory Rookie Orientation Program under supervision of INDYCAR officials. Busch fulfilled all three phases of the program around the 2.5-mile oval – 10 laps at 200-205 mph, 15 laps at 205-209 mph and 15 laps at 210-plus mph. Busch totaled 83 laps in the No. 1 DHL Dallara/Chevrolet/Firestone that reigning IndyCar Series champion Ryan Hunter-Reay will drive in the Indy 500. Team-owner Andretti and driver James Hinchcliffe – winner of two of this season’s four races – assisted Busch during the test. Busch began the test knowing that driving into Turn 1 at IMS in an open-wheel Indy car would provide different challenges from what he’s experienced in a Cup car. Andretti – who qualified for 16 Indy 500s between 1984 and 2007 – was thrilled with Busch’s performance. “Well, I think it was good for us,” said Andretti, who finished an Indy 500 career-best second to Rick Mears by 3.149-seconds in 1991. “We got our first laps in May, so that’s always nice. We wanted to do it in the proper way, and we wanted to do it in the proper way mostly for Kurt. We wanted him to have a real experience. We wanted to make some changes that he could feel and start to understand a little bit more about what to expect with the car in different conditions and different setups. I think we were able to achieve that.